 December to April: Due to Costa Rica’s location, there is always a chance of rain, even in the dry season, but at this time of year it is less likely and if it does rain it won’t be for long. This is the busiest time of year for Costa Rica, particularly December and Easter, when many of the locals head to the beach areas. Accommodation is at its most expensive and demand is high, so it is advisable to book well in advance.  May, June & November: The rains start to pick up at this time of year, but don’t write it off! The steady stream of tourists starts to taper off and things become quieter, a more mellow pace is set. Roads can start to become muddy, particularly in the more rural, off-the-beaten-track areas so if you are self-driving, you should opt for a 4x4.  July to October: This season has the highest rainfall. The storms off the Pacific create perfect swells for those who enjoy surfing. The rural roads often become impassable as rivers expand and flow over some of these seasonal roads, so your routing may require some extra planning. However, this is a time where accommodation prices are considerably lower and many activities such as white water rafting are at their most exciting. Visit Golfo Dulce in October to see the whales using the Gulf as a nursery for their young – a very special sight and it only happens at this time of year. Dry Season, December to April, is the most popular time to visit this region for locals and visitors alike. As a result accommodation does get booked up and is also at its most expensive. Our advice is to book early where possible. If surfing is your thing, then the best time to go to the Pacific Coast would be July – October. The storms result in some great swells and there is excellent surfing to be had in this area. If you are a relative novice, be sure to brush up on your surf etiquette. For a different pace of life, try the Caribbean Coast. Unlike the Pacific coast, there is no dry season as such on the Caribbean coast, it will rain here to some extent throughout the year. The ‘drier’ months are February, March, September and October. September and October is when the rest of Costa Rica experiences the heaviest rainfall. The volcano can be visited all year round. The best and clearest views of this iconic land mass are in the green season (May-June & November). During the dry season the top of the volcano can often be shrouded in a swirl of cloud – either way we think it looks spectacular and is sure to provide you with some fantastic photographs. There is abundant wildlife here from howler monkeys and spider monkeys to big cats such as jaguars and ocelots (although the cats are nocturnal animals and sightings are very rare). The main draw card here is the turtles – best seen during nesting season from March to October. Green turtles are most active between July and August and if it’s leatherbacks you want to see, they come ashore to lay their eggs around April. A spectacular sight to see these enormous creatures so at home in the water, lumber their great weight up the beaches to lay their eggs. 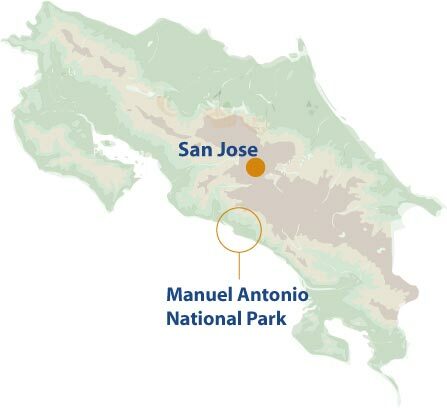 Manuel Antonio is Costa Rica’s smallest and probably most popular national park, this is partly due to its proximity to San José, but also due to the picture postcard beauty and fabulous wildlife. There is a lot to do here so it’s quite easy to pack a lot into a day. The forest comes right down to meet the beach so you could spend a morning hiking in the forest, the afternoon relaxing under the swaying palm trees on the beach and finish off with sundowners whilst watching the spectacular sunset from one of the ocean-view restaurants. Most popular time to visit is December to April.